The ceremony begins as the marriage officiant starts to speak. The bride and groom stand facing each other in front of the officiant, who stands under the beautiful wedding arch, designed by florist Elena Damy. The guests all stand as they listen. The ceremony is just the right size to feel private and still include all of the bride and groom’s closest friends and family. 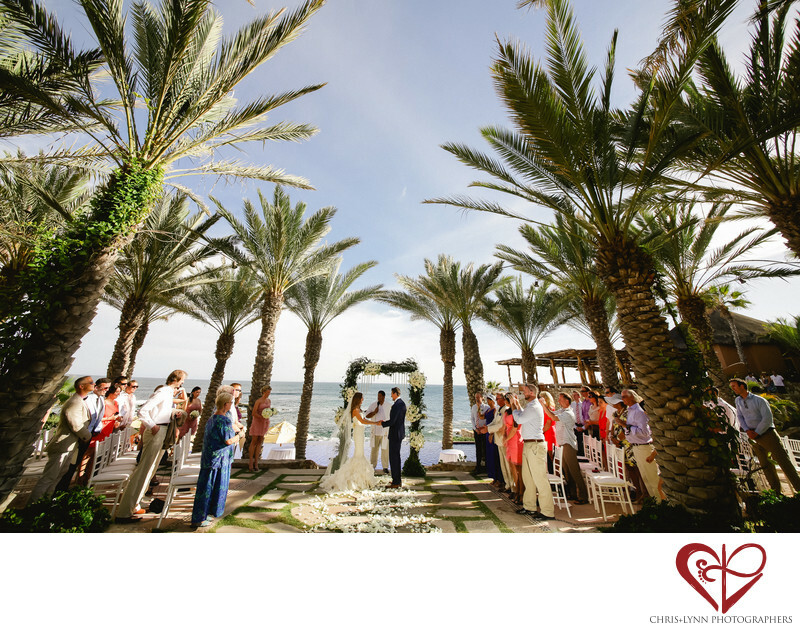 A thin layer of clouds protects the guests from the sunlight, and the tall palm trees keep the ceremony shaded. The evening is warm, and a slight breeze keeps the guests refreshed as they watch the ceremony take place. The beautiful blue ocean provides the perfect backdrop for a wedding ceremony. 1/125; f/8.0; ISO 100; 12.0 mm.